The Hilltoppers started out as a vocal trio consisting of Jimmy Sacca (born 26 July 1929 in Lockport, New York), Seymore Spiegelman (born 1 October 1930 in Seneca Falls, New York) and Don McGuire (born 7 October 1931 in Hazard, Kentucky) who were all students together at the Western Kentucky University in the town of Bowling Green. Sacca was acquainted with a pianist by the name of Billy Vaughn (born .12 April 1919 in Glasgow, Kentucky) who, although considerably older than the trio of friends, fitted their vocal style well and was drafted into the group as a full time member. 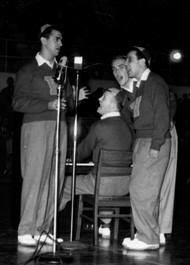 He brought with him a song he had written called "Tryin" which the foursome recorded. They sent the tape to a local radio DJ who in turn drew it to the attention of Randy Wood, the head of Dot Records in Nashville, Tennessee, who duly signed them to the Dot label. The single was a slow burner, breaking region by region but eventually secured a place in the top 10, peaking at no.7. They adopted a college look of beanies and letter sweaters that would become their trademark. 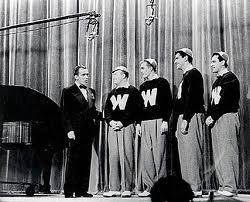 They appeared on Ed Sullivan's Toast of the Town in October 1952 and followed this with The Perry Como Show in November. They also appeared with Patti Page, Kate Smith, Sammy Kaye and Milton Berle. 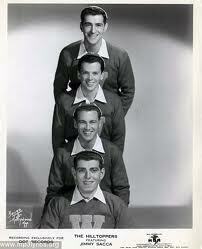 Jimmy Sacca had been called up for military service, and the Hilltoppers went into the studio to record a series of tracks that could be released while he was away. 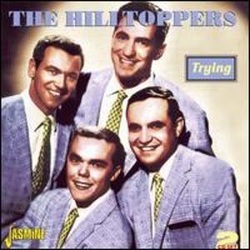 After "Tryin", a whole series of hits followed, "PS I Love You", "I'd Rather Die Young", "To Be Alone", "Love Walked In", "From the Vine Came the Grape" and "Till Then", all top 10s, making the Hilltoppers one of the top US vocal groups of the 1950s. Rock 'n roll was on the way, and the group's clean cut college look and style was rapidly becoming old fashioned. Billy Vaughn left the group to begin his orchestral solo career in 1955, his place in The Hilltoppers taken by Chuck Schrouder. Vaughn went on to have a very successful chart career beginning with the no.2 hit "Melody Of Love" and his repertoire included other top 10 singles: "The Shifting Whispering Sands (Parts 1 & 2)", "Raunchy" and "Sail Along Silvery Moon". 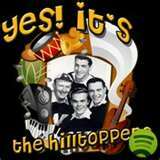 Meanwhile, The Hilltoppers adapted their style in an attempt to appeal to mid to late 1950s teenagers and recorded a series of songs that competed with the top vocal group of the late 1950s, The Platters. Indeed, one of those songs was "Only You (And You Alone)" ,composed by Buck Ram for The Platters. They also enjoyed their biggest US hit with "Marianne", originally by Terry Gilkyson and The Easy Riders, in the midst of the other music craze of the late 50's, the folk music revival. In the UK they only had three hit singles: Only You which hit no.3 in May,1956, a re-release of their first recording, "Tryin" and "Marianne" in the Spring of 1957. 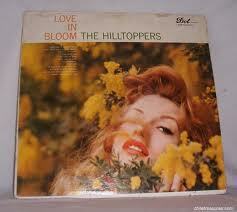 The group remained a fixture of the Dot Records roster for the next decade, finally splitting in 1963. They reformed briefly in the mid 1970s and remade their biggest hits for ABC Paramount, continuing to perform until 1975. 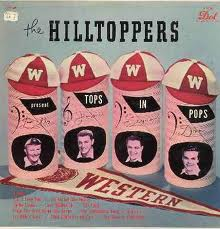 After The Hilltoppers broke up, Jimmy Sacca worked for Dot Records in the early 1960s before forming a new Hilltoppers group which toured worldwide from 1968 to 1979. 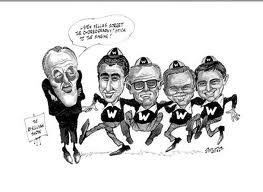 In 1979 Sacca and his son established a talent agency. He lives in Jackson, Mississippi with his wife Ann. Seymour Spiegelman also worked for Dot Records, and later for Peter Pan Industries. He died on 13 February 1987 in New York. Don McGuire started a real estate business in Lexington, and also worked as Western Kentucky University's liaison with the state legislature. He lives in Lexington, Kentucky with his wife Maxine. Billy Vaughn decided not to travel with the group, becoming the music director of Dot Records. He also embarked upon his career as a well-known musician, arranger and composer, hitting the charts often as the Billy Vaughn Orchestra. He died on 26 September 1991 in Escondido, California.